I’m training for my fourth Marathon this winter. I know…I must be crazy! It will be my second time running the legendary Boston Marathon, so I wanted to share one of my favorite jogging/running routes around. To start off, exit the hotel with a quick nod to the doorman and take a left on Exeter. Cross over fashionable Newbury Street and continue onto Commonwealth Ave. Take another left on Commonwealth Avenue and run along the beautiful tree lined Mall in the middle of one of the most historic avenues in America. When you hit Hereford Street, make a right, before taking a left onto Beacon Street. After two blocks, take another right over the Mass Ave bridge towards Cambridge. As you traverse over the Charles River look to both sides. Depending on the season you might see a group of sailboats from the Community Boating Center, the oldest center of its kind in the US, gliding over the water, or perhaps teams of rowers from one of the many local colleges practicing for crew races. Straight ahead is the campus of MIT, renowned home of some of the country’s brightest tech minds. Trivia question- along the mass ave bridge you will see the word “smoots” with a number painted sporadically on the sidewalk. Do you know what a “smoot” is? If so, maybe you went to MIT! Once over the river take a right on Memorial Drive heading east. With expanding Kendall Square on your left and skyline views of Boston on your right, feel free to take a water break and soak in the sights. This is a perfect spot for a selfie with our beautiful city as the backdrop. Sunset is my favorite time to run by here, as there’s a spectacular sun reflection on the water. When you hit Route 28, take a right to head over the bridge back into Boston. You will see the Museum of Science on your right as you head back into the city. At this point, you are crossing over the Charles River locks that transition boats from Boston Harbor to the Charles…a cool site to see! Our Boston Duck Boats also enter the Charles here. Quack quack! 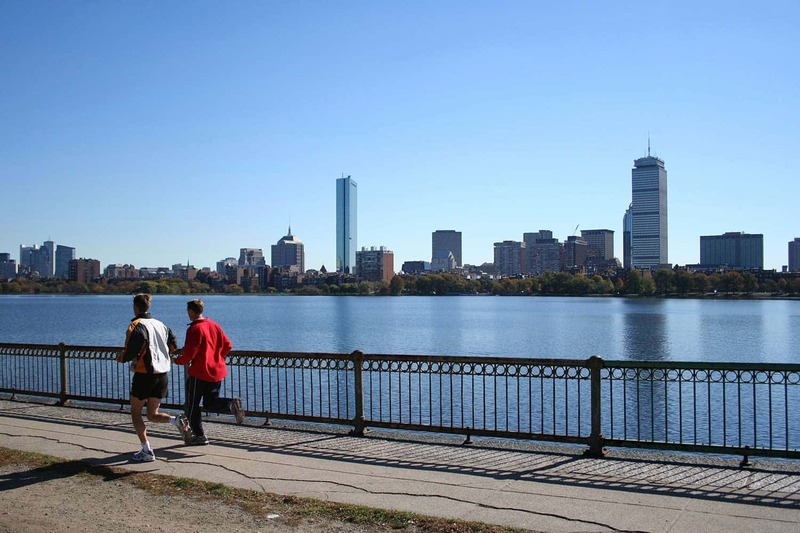 Once over the drawbridge take a right and run along the paths of the Charles River Esplanade and the Famous Hatch Shell. If you happen to be dedicated (crazy?) enough to be running in the winter know that our favorite shoe company, New Balance, has been partnering with the DCR for years to help keep the jogging paths clear in the tough New England winters. You’ll continue by with the Teddy Ebersol baseball fields on your right, and straight ahead you can see the lights on top of the old Hancock Tower. Those lights give Bostonians the weather forecast! Although, during baseball season, flashing red means the Red Sox game has been cancelled due to weather! Just past the Hatch Shell, do a loop around to the footbridge over Storrow Drive and head up Arlington Street, taking in the Public Gardens on your left. Turn right onto the Commonwealth Avenue Mall for five blocks before taking a left onto Exeter Street and returning home to The Lenox Hotel! All told, you jogged about 5.5 miles and you got a great tour of our city. If you’re a Boston Marathon enthusiast, you can add a little extra to the run. Continue up Commonwealth Avenue until you hit Hereford street. There you can make the famed “Left on Boylston” and run down the street to the Marathon finish line, just steps from our front door.